She'd developed a particular way of walking to accommodate her condition. Step, pause, step, instead of step, step, step. You needed that moment's pause to make sure you'd set your foot straight. Like the opening gambits of a dance. Her boots were thick and padded, but one accidental fall or careless stumble could do irreparable damage that would finish her off for good, she supposed. That would be that. I know there have been mixed reviews about this book lately, but I have to say I absolutely loved it and it will be one of those books that I will always keep and read again and again. This book tells the haunting tale of Ida Maclaird who has developed an unusual medical condition - she is slowly turning to glass, beginning with her feet. She is determined to stop the change and heads back to the enchanted island where she believes the transformation began. Once on the island, she searches for the island reclusive Henry Fuaw, who she believes knows something about her condition. Whilst on the island, she meets Midas Crook, a young lad whose life seems to have stood still. Midas begins to help Ida in her search and a transformation begins within him. As they begin to fall in love, Midas begins to experience life and learns to let his past go. This book is just full to the brim of heart ripping emotion. It basically puts immortality in the forefront of your mind and makes you realise that every day does matter and needs to be lived in, not bypassed for another time. Before Midas and Harry came into contact with Ida, there lives were basically at a standstill. They were not really living, they were just existing, yet through her quest for life, they learnt to go for the things they want to experience. This book is about transformations. It deals not only with Ida's transformation to glass, but also with the transformation of relationships from non existent to full blown love. It also deals with the transformation of personalities, every person Ida touches changes the way they live. The story begins with just two characters, but by the end you have a whole cast who are all linked to each other via different channels. The links between them are gradually given as the story proceeds. The writing was detailed and rich with beautiful descriptions. Through the lens of Midas's camera, you begin to look at the minutest things in life with more detail. A raindrop, an icicle and a white orchid all require a closer look next time you see them. This is one of those books that cannot be read quickly, it requires you to devour the detailed information provided and needs to be contemplated afterwards. Ida is a wonderful character, even though she is slowly turning to glass, she is such a warm and giving person, almost blowing life into the people she meets. She accepts her condition with grace and lives for the day. She reminded me of those courageous cancer victims you read about, who know they have a limited time on Earth, yet take the bull by the horns and really experience the joy of living. The book is set in an imaginary setting where an archipelago of islands make up St Hauda's Land. You experience these islands during the height of winter and the book offers you vivid descriptions of snow covered landscapes. You get the feeling that you might just find these islands just above Scotland, hidden by mist, yet just waiting for you to discover them. Although the story is full of magical realism, is is not unbelievable or far fetched. The way the author describes events you could actually believe them happening. The medical condition that Ida suffers with, is written so well and in such detail, you feel that you could open up a medical dictionary and be guaranteed to find the condition. This is magic realism at it's best. 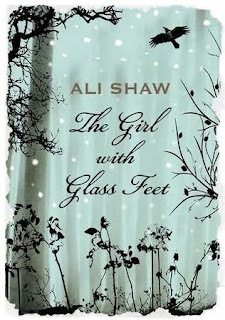 Shaw's book reminded me a little of Sarah Addison Allen books, only The Girl With Glass Feet is lot sadder and more haunting. I absolutely loved this book from the beginning to the end and I was really disappointed when I had finished it. I look forward to reading more from Ali Shaw. You make it sound wonderful. I think I would really enjoy it - not one for the car to be read in snippets though by the sound of it. One to set aside the time for. Love the front cover art work. I'm so glad that you enjoyed it, but I really knew you would because I also loved it. It's now one of my favorite books! Nymeth - I think you will love it. It is like a race against time and then you realise you can't actually beat time. Carmen - definitely not one for the car. A book that requires full attention in order to apreciate it properly. Andreea - you must have written it whilst I was writing mine. Oh I think I need to curb my tongue sometimes. I have nothing against Christian Fiction, just not being one I find it hard to read it. I will give it a go and contact her. You know a book is really good when you hate to see it end. Sounds like this is a lovely book. Ive added this to my wish list as Ive read such a lot about it. Book tokens still left from Christmas I think I'll put this top of the list. Great to hear your views on this, thanks Vivienne. I picked up this book last week at the library based on, I believe, Simon's glowing review. Now I am convinced that I need to begin this book today so that I can have it completed by the time is due. Now THIS is a review I wanted to hear! I've heard a couple meh reviews lately when I used to hear all good, so I've been more leery about picking it up, but now I'm back to really wanting to read it!! Viv, high praises for this book. Now I have to get it once again from the library as last time I returned it unread! Now I regretted now getting the book when I saw it at the bookstore the other day. Great review, Viv! I have been reading mixed reviews of this one. I'm so glad to see you loved it. Vivienne, I completely understand your point. If you don't feel like it, then don't contact her. I was just being the messenger. I also have genres that I don't like and that I don't read and it's okay. We all have our favorite genres that we enjoy reading. I really enjoyed this book, too! I know there have been mixed reviews, and I think that's to be expected- it's definitely not everyone's cup of tea. But it's so atmospheric and really makes you suspend disbelief while you're in that world. That cover is absolutely beautiful, and it does sound like an intriguing book. I'm so glad to read your review of this book. I've been teetering about whether or not I should give it a whirl, and now I will. Thanks, Vivienne! The premise for this story is very unusual, and I don't know if I would have been drawn to it without reading your wonderful review. I liked the Sarah Addison Allen books, and this one looks like a great way to try some more magical realism. I love the cover of this one, and your review makes me want to put my other reading aside, and rush out and find this book. What an interesting affliction! Mary - it is - everyone must read it. Petty Witter - quick, spend those book vouchers! They would be burning a hole in my pocket by now. Molly - I hope you enjoy it too. Amanda - I was worried after reading a couple of dodgy reviews lately. I am so glad I ignored them. Diane - I hope you love it too. Alice - quick, go buy it. Blodeuedd - it is worth a try. Andreea - don't worry, I don't shoot messengers. LOL. I will definitely contact the author. Aarti - it is a lovely book, isn't it. I want to visit these imaginary islands. Pickygirlfoodfilmfiction - what an extraordinary name! You will love it. Beth - lovely to see you stop by as I know how busy you are. I told you would love it. Alyce - I do so love magical realism. I would suggest trying this book. Suko - quick, rush and get it. You won't regret it. I've been in my library's queue for awhile, and I probably won't get a copy until next month, but your review made me even more excited!! This sounds like something i'd enjoy. I like the premise of it. I am so glad that you loved this book as much as I did. *sigh* I wish it never ended.